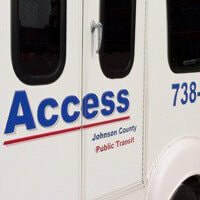 ​ACCESS is a transportation service for citizens in Johnson County. All of our vehicles are wheel chair accessible. ACCESS provides the reservations, scheduling and operation of this service. Drivers are thoroughly trained in safety and passenger assistance. The Transportation Access Committee, a group of local volunteers, assists with financial planning and policies regarding the operation of ACCESS. The purpose of the Transportation Access Committee is to determine, plan for, implement, maintain and evaluate the necessary resources for the transportation needs of all Johnson County residents. All meetings are open to the public. If you would like to attend please contact ACCESS at 317-738-5523 for further information. All of us at ACCESS Johnson County Public Transit sincerely hope this ACCESS RIDERS’ GUIDE answers any questions you may have. This guide is offered in other accessible formats for the convenience of all our passengers. Should you require additional information, please do not hesitate to call ACCESS at 317-738-5523. Thank you for riding ACCESS Johnson County Public Transit! *6:15 A.M. TO 7:30 P.M.
. ACCESS is a curb-to-curb service.
. ACCESS is a shared ride service.
. No assistance will be provided beyond the curb. If you require further assistance, you should be accompanied by a personal care attendant. ALL TRANSPORTATION REQUESTS MUST BE MADE AT LEAST 24 HOURS IN ADVANCE. Make your request as early as possible, up to 14 days in advance, but no later than 24 hours before you wish to ride. The cut off time for a reservation for the next day is 12:00 pm. Eligible ADA riders can call for a ride for the next day up until 4:00 pm. Trip requests requested without a 24 hour notice will try to be accommodated, however there is no guarantee. Transportation requests for subscription trips for the following weeks schedule needs to be in by Friday at 12:00 pm. Please call 317- 738-5523 and follow the prompts for cancellations or if there is an immediate problem with your scheduled transportation. ACCESS’ ZONE to ZONE (demand response) service is available throughout Johnson County. Out of county currently is limited to Stop 11 Road. The outlet mall in Edinburgh is charged as in county. ACCESS is not responsible for lost, stolen, or damaged items. To check on a lost item, please feel free to call 317-738-5523. There may be times that Johnson County declares a county wide emergency or if Johnson County Government Offices close. In these cases ACCESS will not operate on that day. ACCESS reserves the right not to operate on certain roads if it is felt to be unsafe for passengers as well as drivers. No knives, guns, or weapons on the vehicle. Boarding: Assistance is provided from the curb to the vehicle. Drivers are not permitted to leave their vehicle unsecured or to enter a building or residence. If you require additional assistance you should b accompanied by a personal care attendant or make appropriate arrangements in advance. Access drivers are trained to assist you with boarding and exiting the vehicle. Assistance include, but is not limited to; offering a steadying arm, maneuvering wheelchairs onto the lift, operating the lift, and securing the mobility devices / seat bes. You may request to board by standing on the lift. SEAT BELTS: All drivers and passengers are required to use the seat belts provided in Access vehicles. Drivers will provide assistance as necessary. The driver will not move the vehicle until all passengers are properly secured. MOBILITY DEVICES: Drivers are to secure all mobility aids such as wheelchairs and scooters. Passengers must allow their devices to be secured and must also use the passenger restraints belts provided. Proper securement is required for transport. For your safety, please make sure your mobility device is maintained to manufacturer’s specifications. Note * can put name and phone number on back of used ticket put in farebox it will be put into monthly drawing. We will draw one each $100 worth of tickets each month. Day and Monthly Passes are not eligible for drawing. We are committed to providing courteous and efficient transportation services. We can only resolve problems if we know about them, so please call us as soon as possible. 317-738-5523 (317-738-3951 TDD for the hearing impaired). Please leave a message if voice mail picks up. Only as many carry-on packages that can be carried in one trip and with a combined weight of no more than 50 pounds, (Please note: hazardous materials are not allowed). No additional packages can be transported because of limited space. passengers (or companions) are responsible for transporting packages. We do transport passengers with a respirator or portable oxygen supply (these must be able to be secured). Call ACCESS at 317-738-5523 (Indiana Relay for the hearing impaired) between 9:00 AM and 4:00 PM Monday through Friday (closed for lunch from 12:00-12:30). Please leave a message if voice mail picks up during regular business hours. Voice mail is checked frequently throughout the day. Make your request as early as possible, up to 10 days in advance, but no later than 24 hours before you wish to ride. The cut off time for a reservation for the next day is 12:00 pm. Eligible ADA riders can call for a ride for the next day up until 4:00 pm. Trip requests requested without a 24 hour notice will try to be accommodated, however there is no guarantee. Transportation requests for subscription trips for the following weeks schedule needs to be in by Friday at 12:00 pm. We will try to accommodate, however there is no guarantee if there is no advance notice of trip..
To serve the greatest number of passengers, ACCESS can only accept two round trip requests per phone call. If you wish to schedule repeat service (work, church, etc.) you may schedule subscription trips. Subscription trips are ongoing and/or regularly scheduled trips to the same destinations. These may be scheduled up to a month in advance with one phone call. Under American Disabilities Act (ADA) regulations, only 50% of our trips can be subscription. First come first served. REMEMBER: the sooner you call the better your chance of getting a ride when you need one! When calling for a ride, we urge you to schedule a time for your return trip. Waiting until the last minute to schedule your return trip could result in a long wait. If there are no openings for the time requested you may be offered an alternate time, as close as possible to the original time requested. If there are no openings for the day and time requested, please feel free to call ACCESS at a later time to ask if there have been any cancellations. Riding ACCESS is just like riding any other public community transportation system, there is a scheduled arrival time and you must be ready when the vehicle arrives. The driver is only permitted to wait 5 minutes. There may be additional stops before reaching your destination. before departure. Please have exact change ready, or your trip ticket ready. To cancel a ride, please call 317-738-5523 (Indiana Relayfor the hearing impaired). If you follow the prompts this will call a pager, or After hours please call pager number 317-562-7241 to cancel a ride. A “no show” is if a driver shows up for your scheduled ride and you don’t! So that our passengers reach their destinations on time, drivers are only permitted to wait 5 minutes after your scheduled pickup time. Passengers who miss their ride or fail to call to cancel their trip will be required to pay for the “no show”. Any other scheduled trips will be canceled unless we get a call from you. Please call 317-738-5523 to cancel a trip so as not to be a “no show”. Please leave a message if voice mail picks up. Voice mail is checked frequently throughout the day. After business hours call 317-738-5523 (calls a pager) and follow the prompts to cancel or in case of emergency. Please leave a message and a phone number in case we need to call you back. In the event of a No Show where the reason is Unknown. Access will make a reasonable attempt to try to contact the client for further details. Frequent no shows (5 or more and at least 10% of the total trips scheduled in a given month), late cancellations or frequent (7 or more and at least 20% of the total trips scheduled in a given month) that are within Rider Control or Unknown will be monitored on a rolling 12-month basis, and may result in suspension, as per below. Passengers with 1 "no show" will be required to pay for this unnecessary trip before any future rides can be provided. Clients may opt to pay for their outstanding No Shows and / or Cancellations to avoid suspension, trips that were due to be funded by a 3rd party will be charged to the client at the standard fare. Drivers will not accept payment for no shows or cancellations. Payments must be mailed to the address below. In reference to issues of confidentiality, we abide by the Notice of Privacy Practices for Protected Health Information.
. In order to ensure the vehicle will be on time for other passengers, the driver cannot make unscheduled stops.
. If other passengers need to get on or off the vehicle before your stop, it may be necessary for you to temporarily change seats.
. Please do not change seats unless instructed to do so by the driver.
. A passenger may not refuse to ride with other passengers. If there is an ongoing problem with another passenger please call (317)738-5523.
tell us when your scheduled appointment is. please remember the driver may be picking up and dropping off other passengers before reaching your destination. be prepared for delays due to traffic or bad weather. plan your trip. For example, if you must be somewhere at 10:00 AM, you may need to be picked up at 8:45 AM.
. The vehicle can wait only 5 minutes past your return pick up time.
. Please be ready at least 20 minutes before your vehicle is scheduled to arrive. All passengers boarding at that stop should meet the vehicle when it arrives.
. If an ACCESS vehicle hasn’t arrived after 20 minutes from your scheduled pick-up, please call 317-738-5523.
. Due to traffic and weather conditions, cancellations, etc., the vehicle may arrive 20 minutes before or after your scheduled pick up time. For example, if your pick-up time is scheduled for 8:00 AM, the vehicle may arrive anytime between 7:40 and 8:20 AM. If you miss the vehicle for your scheduled ride, please call ACCESS, another vehicle will be sent as soon as possible. However, it may take up to three hours for another driver or vehicle to be available. WHO CAN RIDE WITH ME? If you have a personal attendant, he/she may ride with you at no additional cost, if you arrange this with ACCESS at the time of scheduling. NOTE: Personal care attendants (PCA) must have the same origin and destination as the passenger they are accompanying. Friends or relatives traveling with you are considered traveling companions, and must be scheduled in advance. Companions who ride with you will be charged the full fare.
. ACCESS requires you to reserve a space for your companion or personal care attendant when scheduling your reservations. Failure to do so may result in the attendant or companions being unable to ride with you if seats are not available. You must reserve space for children when scheduling your trip. *A state approved car seat is required for children 4 years and under. Car seats are not available through ACCESS. *Subject to change if law changes. Passengers with disabilities may bring a service animal. The animal should be on a leash and must be under the handler’s control. They should sit or lie on the floor without blocking exits. May be excluded if exhibits a direct threat to the health/safety of others. Please let ACCESS know when you schedule a trip. Pets may be transported with a passenger if on a leash or in a kennel style pet carrier and must be under the handler’s control. They should sit or lie on the floor without blocking exits. May be excluded if exhibits a direct threat to the health/safety of others. Please let ACCESS know when you schedule a trip. NO off route deviations by the bus is available. To help plan your use of this service refer to the schedules. To help plan your use of these services, please call 317-738-5523 for a map and schedule. A ZIP CONNECT is a flexible fixed route that extends service up to one mile off of their route. There are 4 Zip Connect routes operating in Greenwood (East and West) and Franklin (East and West) Transfer points are available with IndyGo in Greenwood at Greenwood Park Mall, Community South, and Walmart on County Line Road. If you are unable to get to the listed bus stops please call with a 24 hour notice to get a deviation. You must call with a 24 hours in advance of your trip to make a reservation for a deviation. It is not necessary to be a ADA certified rider but by law ADA riders get priority. Otherwise: Scheduling a ZIP CONNECT is a first come first serve basis. Must call to cancel a ride 1 hour before scheduled pick up, or you may be charged a no show. Frequent cancellations will result in loss of your subscription (ongoing trip requests) since others are waiting for a ride. Limit carry ons to only what you can physically carry personally in one trip (Folding shopping carts are permitted). Passenger are responsible for their own packages. All ACCESS vehicles are wheelchair lift equipped. For help planning your trip please call 317-738-5523 or 317-738-3951 (hearing impaired). Why is riding the public transit system a good idea? What if I have an emergency at home? How can I get home if I rode to work on a ZIP LINE? No problem, ACCESS will get you there on our county-wide system at the same fare as the ZIP LINE OR ZIP CONNECT. It is ACCESS’ policy to provide the safest and most efficient service to all ACCESS passengers and to meet the requirements of the Americans With Disabilities Act of 1990. ACCESS must rely on certain guidelines that ensure quality service for all ACCESS passengers. Passengers who abuse these guidelines can adversely affect the ACCESS community transportation system as a whole. For the safety and comfort of all ACCESS passengers, ACCESS has established the following policy that addresses instances when a passenger’s conduct may negatively affect others using ACCESS.
. UNSAFE CONDUCT: Any act which creates the potential for injury or other risk to any passenger, driver or the general public.
. Eating, drinking, chewing tobacco, or smoking are not permitted.
. Passengers may not operate any audio or visual equipment which infringes upon other customers’ comfort or safety or impairs the driver’s ability to transport passengers safely. Examples include: audio/visual devices without headsets, portable video games that have sound effects, etc. 1). Any act that would qualify as misconduct, but is the direct and immediate consequence of the passenger’s disability, such as abusive language that is the consequence of Tourette’s Syndrome. 2). If a passenger commits an act of unintentional misconduct, and he or she has had training in the appropriate behavior, that act will be treated as intentional. CONSEQUENCES OF HAZARDOUS OR ABUSIVE MISCONDUCT: is punishable by the following accelerating suspension schedule. The second suspension occurrence will result in a seven (7) day suspension penalty. The third suspension occurrence will result in a 14-day suspension penalty. The fourth suspension occurrence will result in a one (1) month suspension penalty. The fifth through twelfth suspension occurrences will be reviewed by the appeals committee on a case by case basis. The appeals committee will determine an appropriate action for each case based on the severity of the problem. The timeframe for the progressive suspension policy is one (1) calendar year beginning on January 1st of every year. A passenger may be required to ride with a personal care attendant. 2) A passenger may be required to undergo behavior modification training. 3) A passenger may be subject to any reasonable accommodation that will ensure the safety of all passengers and drivers. The accommodation may last for a time period sufficient to allow the passenger to learn appropriate behavior. The accommodation may be ongoing if the conduct is beyond the passenger’s control. We reserve the right to stop service depending on the seriousness of the offense. The passenger will be notified by mail of the suspension/termination and the effective day of the suspension/termination. Should the passenger request a suspension appeal hearing concerning the suspension or termination of existing service, an appeal committee consisting of a three (3) person panel of individuals not involved in the original decision will be formed. This appeal procedure is unrelated to eligibility and will not be used for contesting established Access Johnson County Public Transit policies. Conduct a hearing within 30 working days of the passenger’s request to affirm or rescind the suspension/termination decision. Service will continue until the committee renders its decision. The decision of the appeals committee is final. For information on Access Johnson County Public Transit’s civil rights plan and the procedures to file a complaint contact Jennifer Moss at 317-738-5500 and TTY contact 317-738-3951 jmoss_gatewayservices@yahoo.com or visit our office at 3500 N Morton St. Franklin, IN 46131. For more information visit www.accessjohnsoncounty.org. Abusive Conduct-behavior which invades the privacy rights of others, or touching another person in a rude, insolent or angry manner. Examples are profanity, screaming, hitting, sexual harassment, etc. ADA-Americans with Disabilities Act; signed into law in 1990, making it illegal to discriminate against persons with disabilities regarding employment, public services, public accommodations and telecommunication. The intent of this law is to provide equal opportunity to persons with disabilities, allowing them to fully participate in society and live independently and with economic self-sufficiency. Companion-A person accompanying the ACCESS rider. Curb to curb-The ACCESS vehicle will pick up and drop off the passenger at the curb of the address of their destination. It should be noted that the ADA definition of disability is not the same as other definitions of disability used in other federal laws and programs such as Social Security, workers compensation, veteran’s programs, etc. TAC – Transportation Access Committee – a group of volunteer Johnson County residents who meet each month in an advisory capacity to ACCESS. The group assists in procedures regarding the operation of ACCESS service. All meetings are open to the public. No Show-If a driver shows up for your scheduled ride and you don’t. PCA-Personal Care Attendant – an individual who accompanies a person with disabilities who requires more assistance than being helped on or off the vehicle. A PCA rides at no charge. Service Animal-Any guide dog, signal dog, service dog or other animal individually trained to do work or perform tasks for the benefit of an individual with a disability. Service Area–ACCESS is available all throughout Johnson County. Out of county currently is limited to Southport Meijer’s, and Stop 11 Road. The outlet mall in Edinburgh is charged as in county. Subscription rides-riders may reserve rides for a particular time every week or every day, rather than calling each day. Subscription service may not absorb more than fifty percent of the number of trips available at a given time of day, unless there is non-subscription capacity left over (no denials). Unintentional Misconduct-poor behavior that is the immediate consequence of the passenger’s disability. Thank you to the following sponsors that are only a few of many that helps to make this public transportation service available to Johnson County citizens.